Though my family no longer officially celebrates a Chinese New Year, we have an old tradition to have a dinner together with some of our relatives. Before we take a dinner, one of my uncles gave me a bottle of wine. He said the wine was bought when he took a holiday in France a few years ago and it become a quite old wine. He also said that the wine is one of the best wines. However, this time I will not discuss about that wine but I want to talk another thing that related to the wine. Twenty or thirty gallons means approximately hundred liters water can be stored to the jars. It is very much. Then what happens next? Now let’s look further, what was given through the Jesus’ miracle was not just an ordinary wine, but said as the best wine. Then its best wine enjoyed by the guests and to be a blessing to many people there. The situation might be so different if which is served plain water only. My beloved friends, from this story we can take important lessons: Like what actually we are today? Are we still like plain water, or water that is in the process to be wine, or has become the best wine? 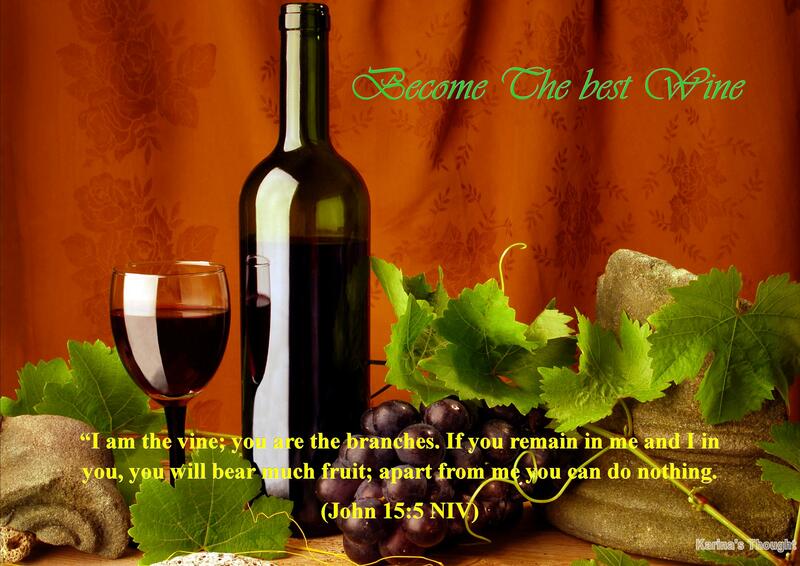 Just as Jesus could change water into wine, He can change us to be a best wine that can bless and brings joy to many people. Or we have become a wine but not to be a best wine instead becomes a sour wine? I am reminded of the allegory about the vineyard in the book of Isaiah 5:1-7. This was an allegory about God the owner of vineyard and His children were described as vines. If we read all verses, this passage specifically spoke about repentance that yields fruit. When we repent and accept Jesus, we supposed become a new creation that continues to grow and bear fruit with excellent quality. But in our daily lives, very sad and ironic I still found many Christians who repent and accepted Christ as personal savior does not growing and fruitful very well. As a grape that looks very good from the outside but it turned have a bad taste. There are many Christians who falling back into the sin and still doing old bad habits or even fall into a new sin. Wearing “clothes of Christianity in order to looks good but in fact has an opposite personal life to the true Christian life. Finally, we become a stumbling block and make God disappointed. “Take your sharp sickle and gather the clusters of grapes from the earth’s vine, because its grapes are ripe.” The angel swung his sickle on the earth, gathered its grapes and threw them into the great winepress of God’s wrath. God was angry and disappointed! Is it reasonable? Yes of course! He has given all the best for us; even he was willing to sacrifice his only Son for our salvation. But we still prefer to follow the pleasures of the world. He has shown all His ways through the Bible, but we do not want to read it. God has bestowed the Holy Spirit to guide us, but we continue to pollute ourselves so that the Holy Spirit does not like to dwell in it. How we can remain to grow and bear high quality fruit? Now let’s back to the story of Marriage at Cana. Another important lesson that we can take from it is, initially Jesus Himself told to the servants to fill the jars with water. Crossed in my mind, if only Jesus did not tell to the servants to fill water into the jars, so the wine would not be available. What is the important thing that we could learn from this part? This section refers to how important we always fill ourselves regularly with the God’s living word in order to become the best wine. God’s word is the most important thing in our life. Here we can learn that obedience to Jesus is an important factor as well. So in short we can see that if we humans are in the Jesus’ hand, obedient to Him and always fill ourselves with the God’s word, then we can be changed to become wine (blessing) for others. My beloved friends, let’s together encourage each other in prayer in order we always willing to be formed and changed, remain strong to go through all processes, and continue to grow in God’s providence so we will bear much and the best fruit and become not just an ordinary wine but the best wine so the God’s sweet love and glory can shine through us and we can be a blessing to many people. Amen. God loves enough to keep giving us chance after chance to get it right. Miss a beat when influenced by Satan, and you may never get another chance to receive God’s forgiveness. Yes, I’m convinced beyond anything I know or see–no evil or wickedness in high places–The White House, the court house, or any other place, shall ever separate us from the Love of God! Our God Reigns victoriously and when we endure, standing firm on our faith in Him, we will see the victory! Amen! 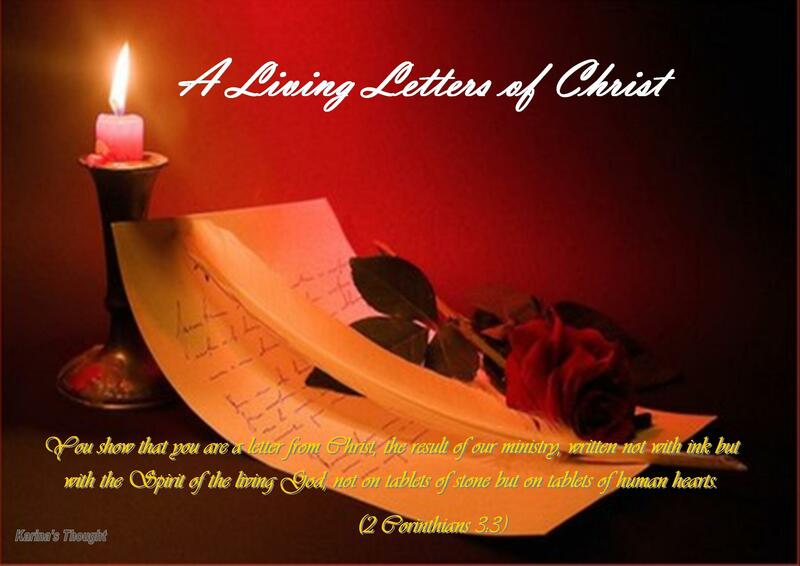 A Great post of my new blog friend Maryhallrayford. Worth to read and ponder. How convinced are we of the truth of God’s Word? When I look at the things going in our society today, where it appears that Satan’s reign is winning against God, I begin to understand what Paul is saying. I understand that our faith in God’s Word is not based upon what we see, but on what He says–no matter how things look. It looks like those living in opposition to God’s Word are negating the rights of those who live according to The Word.